Bettina Hoy is admired as one of the best riders in the world. Actually, at Back in Action she has an even stronger reputation as one of the most gentle, kind, yet determined sports people we've met. Bettina has recently told Back in Action of a wide number of benefits she has received from using a Mobiliser, but instead of asking for endorsement money, she is allowing us to publish her experience in the hope it will bring similar benefits to others ... including her rivals for gold in 2012. How wonderful. Our personal thanks! Bettina was really enthusiastic about the changes she had experienced since buying her Mobiliser to take to the 2008 Olympics. Bettina told David that for as long as she can remember she has had a daily and troublesome headache. Typically once a week she would experience a “black room” headache that could not be ignored. 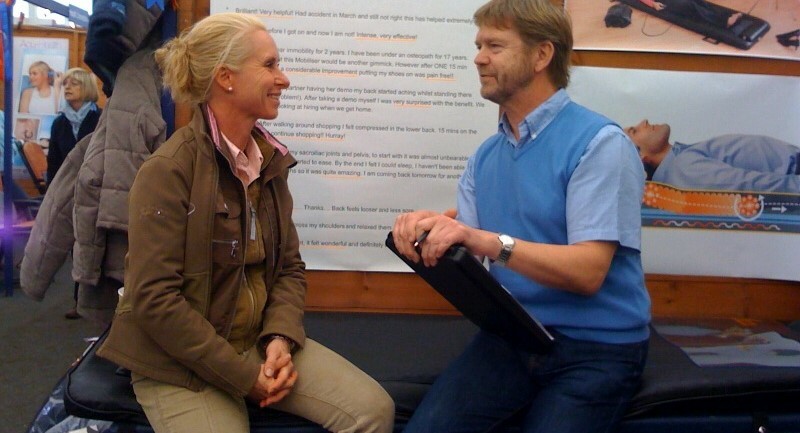 NB Bettina initially reported several days of even more intense headaches after starting to use the Mobiliser, but she continued after her friend, leading Dressage Rider and coach Sandy Phillips, (who had suggested the Mobiliser to Bettina) said that she too had experienced initial headaches which passed after a few days. Bettina says that she doesn't find sleeping easy, but once using the mobiliser she drifts off to sleep easily and sleeps more deeply, even when tense or nervous pre-competition. When Bettina told David of improvements in her riding it was difficult for David to accept at first. After all Bettina is a rider of exceptional quality. However Bettina explained that whilst even experienced horse Ringwood Cockatoo went better, it was in the young horses that Bettina found the greatest benefit from Mobiliser use. Bettina says that bringing on a young horse involves getting the horse to move its natural weight distribution from 70/30 to 50/50. The rider gradually achieves this by an intimate and invisible connection with the horse in which the riders body encourages some movements and opposes others until the horse adopts the desired movement. An Alexander teacher uses similar techniques in a lesson with people so that “good use” is welcomed and “bad use” can be felt and rejected. Bettina can complete a gruelling cross country with ease several times a day, yet she still noticed an increase in her stamina and performance after using the mobiliser. Bettina told David that her daily run is now completed with less effort, especially running uphill. This benefit has been reported by other leading athletes although Bettina and David agreed its difficult to know if its related to the increase in lung capacity (measured by MOD / NATO) or the improved sleeping (see above) as both would create similar stamina improvements.